CS-Cart is one of the bright representatives of paid open source e-Commerce solutions. Main benefits that led platform to success are high functionality, convenience, advanced marketing tools and reasonable pricing. However, it has cons like lack of extensions and no SMM options. These are main reasons that prompt CS-Cart users to move their stores to another shopping cart. A lot of them decide to migrate CS-Cart to Magento, which has a large number of extensions, reach features and helpful community. Cart2Cart will be really helpful in such a situation. 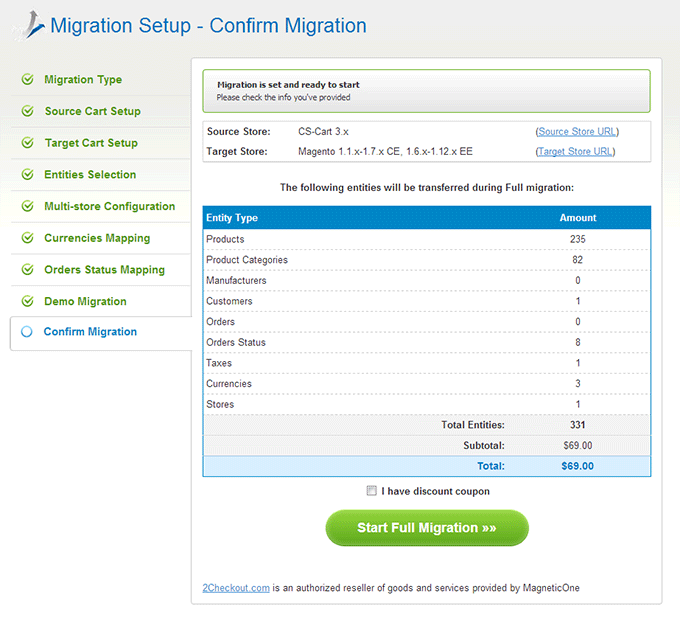 It will move all products, customers and orders from CS-Cart to Magento accurately. The price depends on quantity of items you would like to move. After looking through a straightforward step by step video or text instructions, you will understand how easy it is to migrate with Cart2Cart. 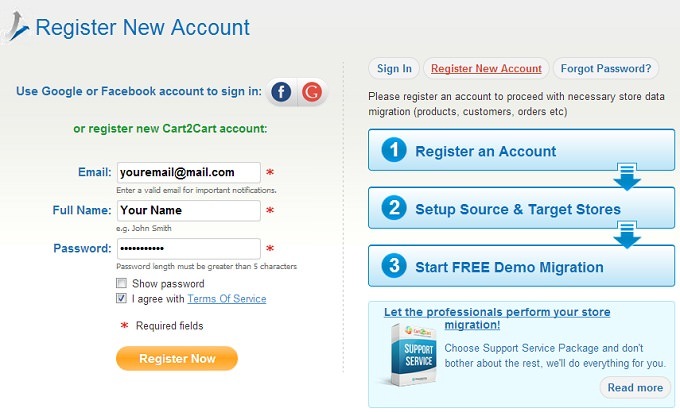 Cart2Cart provides a possibility to sign in via Google or Facebook profile or create a new account. On this step, you have to provide information about your Source Cart. 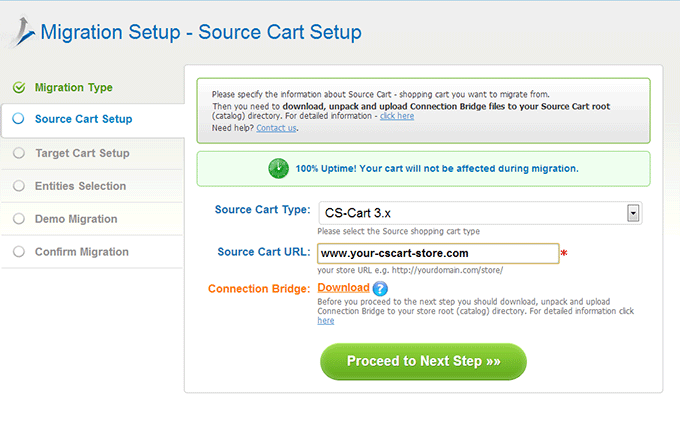 Choose CS-Cart from the list and enter web store's URL. 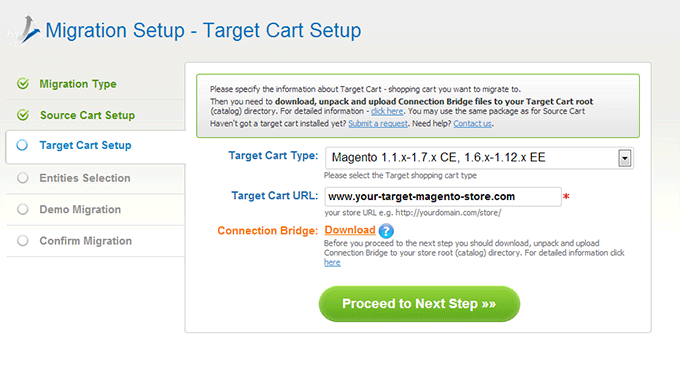 The next stage is to install Connection bridge, which will give Cart2Cart access to your store data. Firstly you have to download file. Secondly, extract it from zip archive. Thirdly, paste it to the root directory of the shop. If there is something you misunderstood, look through our FAQ with video tutorials. According to the same principle, provide information about your Target Cart. Choose Magento as your Target Cart. On this stage, you should put ticks near entities that have to be moved or choose click Choose All. It is also possible here to select one or several additional options. 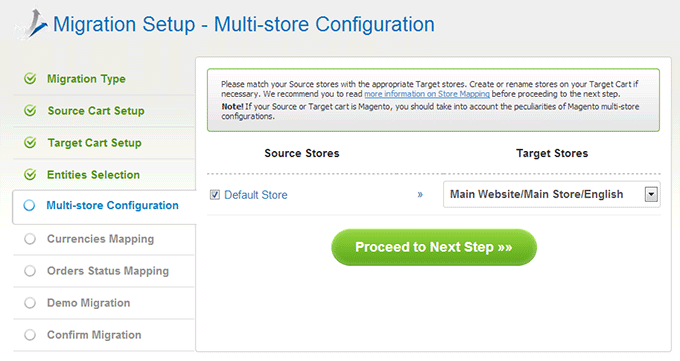 Since Magento supports multi-store, you are able to map Source and Target stores. 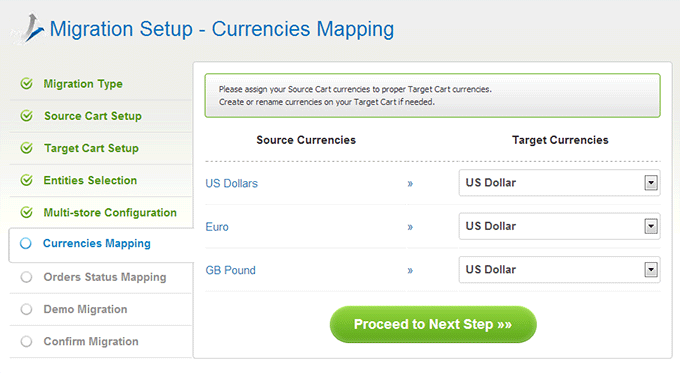 In a case you used more than one currency on CS-Cart store, there is an opportunity to map them with currencies that will be displayed on Magento store. Cart2Cart provides a possibility to map order statuses for better convenience in future store management. Want to try how everything works? On this phase, you can do that. 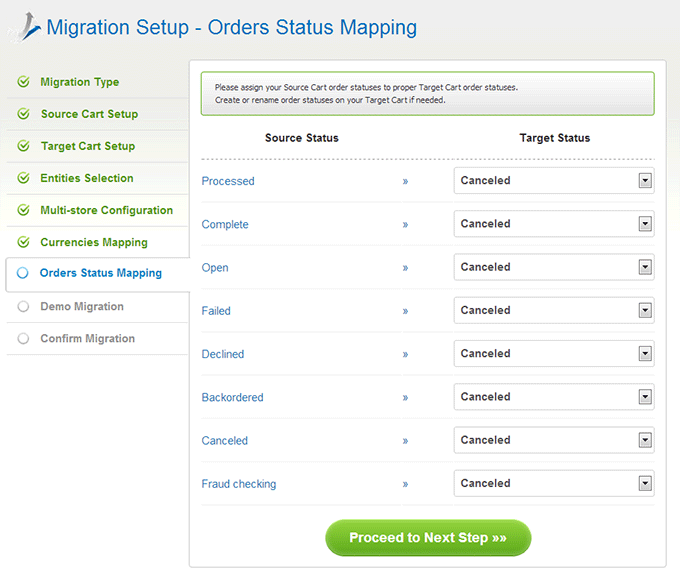 Demo migration is totally free and will take you only a few minutes. 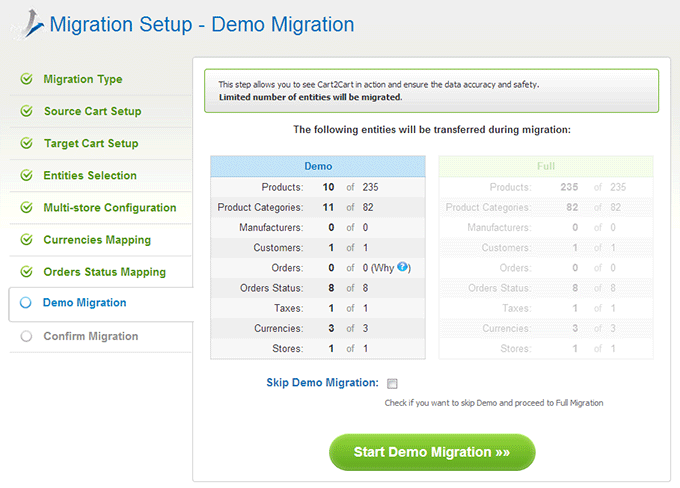 You can read more information about Demo Migration here. The next thing you have to do is make sure you have enough money on an account, check if you have a discount coupon code. On this stage, it is also possible to check entities one more time. The process of migration will take some time, so you can close a browser window. When migration will be finished, you will receive an email. 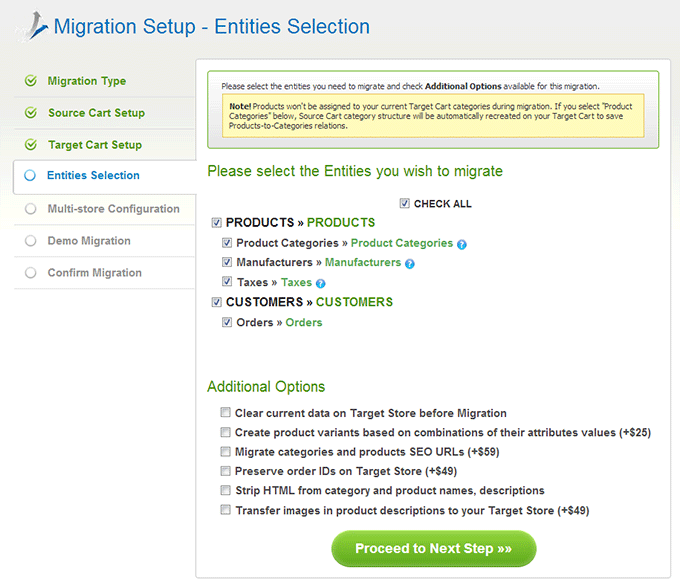 After that, you can check migration results on newly established Magento store.